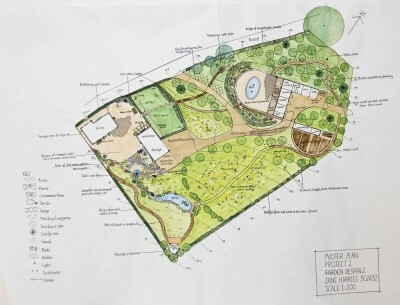 I confirm what you want through discussions with you and through receiving your emailed Garden design briefing form. You would send me photos and a plan of the site, with dimensions, so we know exactly what space we are dealing with, including slopes. Use this guide to help you: How to Measure Your Garden. I draw up a scale plan of the existing site and then brainstorm on ideas to produce some options, with rough plans and sketches. At this stage I often use an online ‘Pinterest’ board onto which we can both post ideas. You decide which option to develop and any initial changes you would like. I produce a layout plan to scale of the option you have chosen. See Costs page for details of costs. I can then do more detailed structural and working drawings if necessary, to brief your contractor more precisely, as well as maintenance schedules to assist in garden upkeep. I can also produce a planting plan, showing plant names and how many of each are needed – see below. Plant maintenance advice can be added. Again, see the Costs page for details. 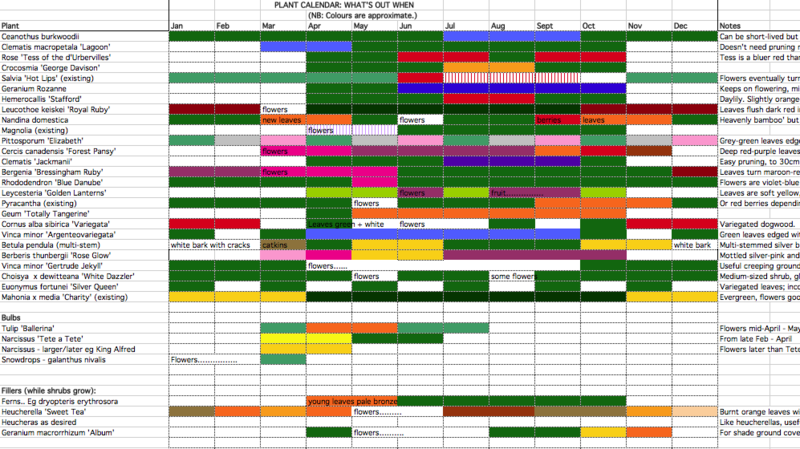 For a planting plan the process is slightly different. You would complete a Planting Plan briefing form, with photos and measurements. I would then discuss outline ideas with you, work with your feedback then send you the final planting plan showing each named plant in position, with a plant calendar showing what’s out when (these are very useful to show what colours will appear when, during the year) and an online ‘Pinterest’ board of photos of all the plants.